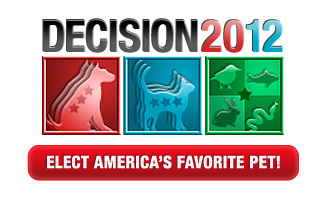 Animal Planet is having a contest called Decision 2012 to decide what type of pet is America’s favorite. It is being run like a mock political campaign and election. You can submit pictures or videos to “nominate” their pet. Pet categories are Dogs, Cats, and Independent – for all other pets. You then rate each pet photo or video, and you can comment and “campaign” for a pet with Tweets and Likes. The contest will have different categories as it progresses. The first categories is cutest, and others include smartest, most talented, most athletic and funniest. Exactly how Decision 2012 works can be found here. It is kind of hard to explain succinctly given the use of the election format. Description of the Dog Party: Dignity, security and great hair are just a few things dogs have to offer. Description of the Cat Party: Cats have gotten a bad rap, and it’s time to set the record straight. Description of the Independent Party: Don’t let the two party system of Dogs and Cats limit your choice for America’s Favorite Pet.